The bright blue, turquoise waters of the Greek Islands have inspired many a postcard, but it is difficult to imagine a more beautiful spot than the Blue Caves of Zakinthos, an island with a unique landscape of steep coastal cliffs, green valleys and many gulfs and beaches. Carved by thousands of years of erosion and changes in geology, the Blue Caves are most famous for the color of the water in the deepest sections, which glows particularly brightly in the morning hours. The reflection of the clear blue waters on the white stone walls of the caves creates an almost surreal environment that can be seen on a boat cruise of the area. The Blue Caves are located on the northern part of Zakynthos, east of Cape Skinari. They can be reached via boat cruise. Sail to Smugglers Cove, also called Shipwreck Beach, along Zakynthos’ coast on this full-day cruise. Board a sightseeing boat in Zante Town and relax as you cruise past beaches and resorts. Pass the Blue Caves, drop anchor off Smugglers Cove to swim and soak in the views, and then cruise back to port with another swim stop on route. Family-friendly trip with hotel pickup and drop-off in selected hotels included. 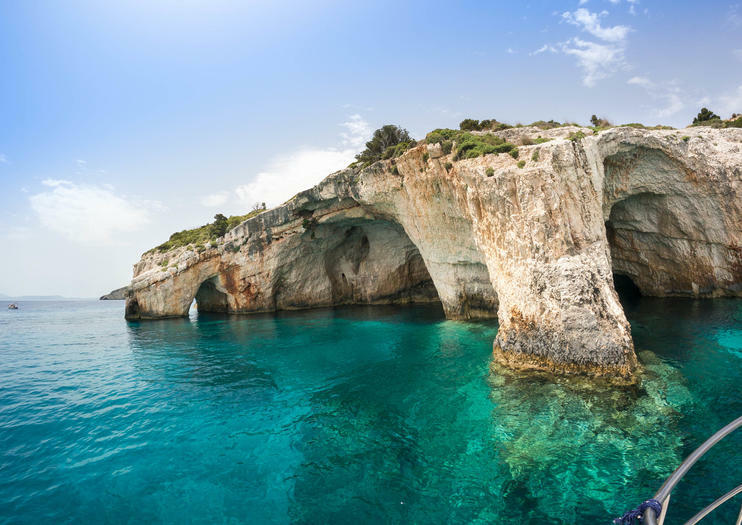 Admire the coastline of Zakynthos by boat, including the Blue Caves and Shipwreck Beach, on this full-day cruise. Feel the wind in your hair as a sightseeing boat carries you along the island's most scenic shorelines, with a photo stop at the Blue Caves, and time to relax and swim off Shipwreck Beach. Two further swim breaks and two additional photo stops plus central pickup and drop-off at all Zakynthos’ main resorts are included.